Help produce materials for the Poor People’s Campaign. On December 4, 1967, Rev. Dr. Martin Luther King Jr. announced plans for a Poor People’s Campaign and called for the nation to take dramatic steps to end poverty. In the wake of his assassination the Campaign went forward but fell short of its vision. 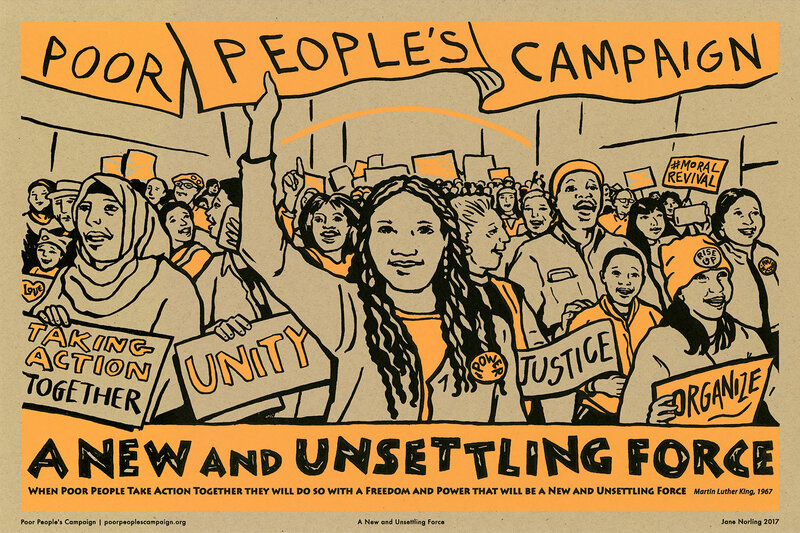 Fifty years later, a new Poor People’s Campaign has emerged from over a decade of work by grassroots movements fighting to end poverty, racism, militarism, and environmental destruction. The Poor People’s Campaign: A National Call for Moral Revival is building a broad and deep national movement—rooted in the leadership of poor people—to unite from the bottom up in a Campaign that can bring forth a moral revolution of values to achieve equality and justice for all people. Please bring brushes, yogert containers or small plastic cups, and snacks to share! NOTE: The UE Hall is not fully accessible. There are stairs into and out of the building.